It is amazing what a few beneficial insects and critters can do for the health of a garden! When gardeners start talking insects, it’s usually not a good thing. Thoughts instantly turn to crop-killing invasions by slugs, or attacks by cabbage worms, moths and more. But truth be told, many insects are quite helpful to the home gardener. In fact, not only can they help control other pests, but many even help pollinate crops as well. One thing is for sure, a healthy balance of insects in your garden can keep the need for pesticides at bay. Here is a look at 4 beneficial insects that can help keep your garden pest population under control, and plants blooming and booming. 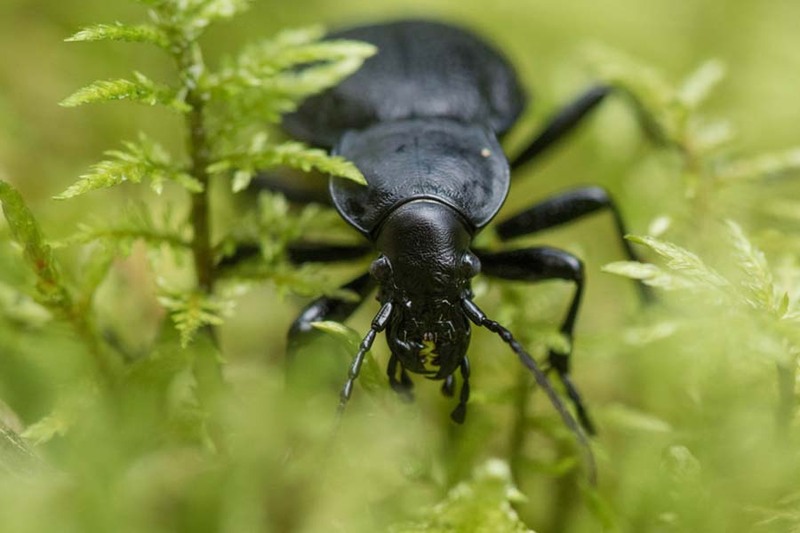 Ground beetles are beasts when it comes to controlling all kinds of garden enemies. Although they look quite menacing (see cover photo above), they are actually wonderful to have around. They love to eat cutworms, snails, caterpillars, and one of the ultimate foes for many, slugs! Ground beetles love to work in soil with lots of protective cover and moisture. Using mulch around plants and in flowerbeds is the perfect way to create an environment suited to their needs. You can also plant perennial flowers and ground cover to give them plenty of space to hide out. Paper wasps are the oft-unappreciated hero of the garden. Their bad name of course comes from the danger of a sting. Although that sting can be painful, their benefits far away their sometimes bad behavior. For the most part, if you leave their nest area alone, they will leave you alone as well. Paper wasps can be a huge benefit in the garden. Wasps are actually an incredible dual-ally of the gardener. First, they have a huge appetite for many plant damaging insects such caterpillars and hornworms. But above and beyond their pest control, they can also help to increase pollination levels of many self-pollinating crops like tomatoes, peppers and beans. Wasps love to drink nectar from flowers – and as they work the flowers of self-pollinating plants, they help to scatter pollen with their fast flapping wings. Some call it flipping, others call it buzzing. But all of that movement means more chances for your crops to have success – by as much as 25 to 30 percent by some accounts! Not to be confused with the Asian beetle, lady bugs are one of the most beneficial insects you can find in your garden. Beyond their simple beauty, they love to snack on aphids, whiteflies, mealybugs, potato beetles, mites, fleas and more. If you want to attract more lady bugs to your garden, plant a little dill or yarrow in around the edges. Both of these plants are highly attracted to the spotted creatures. Lady bugs also love dandelions – just one more reason not to spray them off every year! The praying mantis is one tough insect hunter! The praying mantis has long been known by gardeners as insect eating machines. They are incredibly adept at disguising their long and lanky body, and then pouncing on their prey. The praying mantis will not discriminate in the garden. They are pure predators, and will eat all kinds of bugs – both good and bad. But overall – they can help keep any and all insect populations under control. Do you have a garden tip you would like to share? Or perhaps a few photos and a short story on your own garden? Email us today at info@thisismygarden.com and share it with our TIMG community. You can also use the “Feature My Garden Tip” button at the top of the website to submit your entry. This article may contain affiliate links.